Ancient kamancha, a bowed string musical instrument, joyfully filling hearts, plunging a person into a world of dreams and fantasies, with a sad, charming sound is now been considered as an intangible cultural heritage. Art of crafting and playing with this unique musical instrument presented jointly by Azerbaijan and Iran, was inscribed on the UNESCO Representative List of the Intangible Cultural Heritage of Humanity that includes elements that demonstrate the diversity of this heritage and raise awareness about its importance. The decision was made at the 12th session of the Intergovernmental Committee for the Safeguarding of Intangible Cultural Heritage taking place at the island's International Convention Center from December 4-9. The appeal for the inclusion of kamancha in UNESCO list was jointly made by Azerbaijan's Ministry of Culture and Tourism, Ministry of Foreign Affairs and Permanent Mission of Azerbaijan to UNESCO, as well as the Iranian side. Speaking on behalf of the Azerbaijani delegation, Permanent Representative to UNESCO, Ambassador Anar Karimov noted that the art of playing kamancha covers a wider geography than the borders of Azerbaijan. Musical instruments, which are the national heritage of Azerbaijani people, are rich and diverse. Most of them, created in ancient times, being improved and have reached our days. Since the 12th century such well-known personalities as Nizami Ganjavi, famous musicologist and composer Abdulgadir Maragi, and great Uzbek poet Alisher Navoi, as well as Muhammad Fizuli mentioned this ancient instrument in their works. Kamancha reached the greatest popularity in the 16th-17th centuries. The instrument itself consists of a round body made of walnut wood, a wide neck and connecting them, passing inside the body, a metal rod. In ancient times, the instrument consisted of one string, then two more strings were added, the modern kamancha, however, consists of four strings. Kamancha is an indispensable tool in ensembles of professional traditional music of the East - Azerbaijani mugham. It is also used as a solo instrument. Instrumental plays, folk songs, and mugams are performed on this instrument. 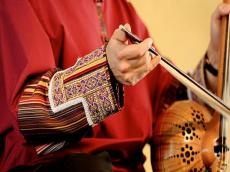 The artistic value of Azerbaijani music and its high importance both for the national culture and to the world community have been universally recognized at the international level: in 2003 UNESCO recognized the Azerbaijani mugham as Masterpiece of the Oral and Intangible Heritage of Humanity. It should be noted that music and craftsmanship of another Azerbaijani musical instrument, tar, was also included in the UNESCO list during the seventh session of the UNESCO Intergovernmental Committee for the Safeguarding of Intangible Cultural Heritage, in 2012. Additionally, UNESCO intangible cultural heritage list includes the Novruz holiday, art of Azerbaijani Ashiq, traditional art and symbolism of Kelaghayi, copper craftsmanship of Lahij, Azerbaijani carpet, and flatbread making and sharing culture: lavash, katyrma, jupka, yufka.